What fun this was! I made 24 x 2 1/2" finished string blocks on phone book pages. 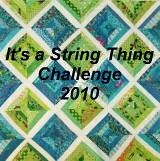 I am a beginner free-motion quilter so dont look too closely!! How cute is this!! Love the controlled colors=just perfect for Valentine decorating! What is the finished size of this quilt? It's adorable. I love the striped binding. Wooo Hooo! You are number one to show a finished quilt for the needle case. I am not good at free- motion quilting. I usually just do some diagonal lines for mine. Thanks for sharing Linda. Thanks for the comments! It measures 17 x 22. Thanks Stacey. That is a sweet needle case.